option of placing wholesale orders directly through our website!! Join our growing list of successful retailers that include Orvis Inc., Eastern Mountain Sports, Waldens Books plus numerous Audubon Centers, Scouting organizations, campgrounds and smaller retail shops across North America. 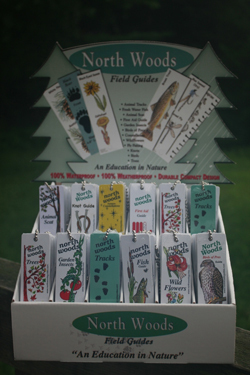 To qualify for wholesale pricing a minimum order of 24 assorted field guides is required. a custom counter top display. We also offer attractive custom Birch bark framed and unframed prints. Please E-mail or give us a call for pricing on wholesale orders.